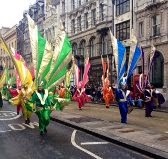 Last Saturday, my family and I went to Fleet Street, London, to watch the traditional Lord Mayor's Show. The 85 minute event originates back at about 800 years ago. Today we see the City's businesses, Livery Companies, charities, Her Majesty's Forces, the city Police and Londoners from all walks of life come together to enjoy a spectacular celebration of London's past, present and future! 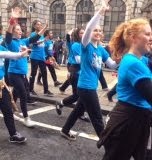 I must say after watching the parade prowl down Fleet Street, I felt very proud to be British!